A tlanta’s Buford Highway is undeniably one of the greatest stretches of roadway for anyone who likes to eat. There are few places in the world where you can get restorative bowls of pho, crispy baja fish tacos, platters of dim sum, comforting orders of bibimbap, and creamy beef korma in one go, and BuHi, as the locals call it, is one of them. Its resplendency of culinary diversity is full of reasons to visit, but if you need just one, make it Food Terminal, one of the country’s newest and most impressive Malaysian restaurants. The restaurant is massive in every sense of the word. The 7,000-square-foot space seats 200 people in fluorescent yellow chairs under soaring ceilings and neon lights. The magazine-styled menu lists approximately 156 items -- from noodle soups to Hainanese chicken to cumin beef skewers -- across nearly 50 glossy pages. Food Terminal is only being thorough: Like Buford Highway, Malaysian food is constructed from a multitude of cuisines and cultures including Indian, Chinese, Thai, and Singaporean. Chef Amy Wong, who co-owns the restaurant with her husband Howie Ewe, always envisioned Food Terminal being this enormous. “I want to open a spot that was reflective of the hawker centers, or food courts, we used to go to Malaysia,” Wong says. Initially, the couple tried for Food Terminal to be a true food court concept, with separate stalls each specializing in one type of cuisine akin to those back home. Logistically, that set-up didn’t pan out as they had hoped. So instead, Wong and Ewe built one massive centralized open kitchen just to the right of the restaurant’s entrance. “We still wanted to keep things extremely casual,” says Wong. “In Malaysia, we’d go to these food courts in the morning, in the afternoon for tea, and for dinner at night. It’s a cultural thing that we want to recreate here.” And it's worked: Food Terminal has multiple customers who visit at least twice a day for lunch and dinner. “We designed the menu with that idea in mind." Going to Food Terminal is like visiting the Disneyland of noodles. There are four multi-page sections dedicated to them on menu, and every variety (except for the rice noodles) is made in-house. Food Terminal takes their noodles so seriously that one devout staff member spends each day expertly producing the restaurant's wonderfully springy and chewy noodles using a specialized machine Ewe designed for the restaurant. 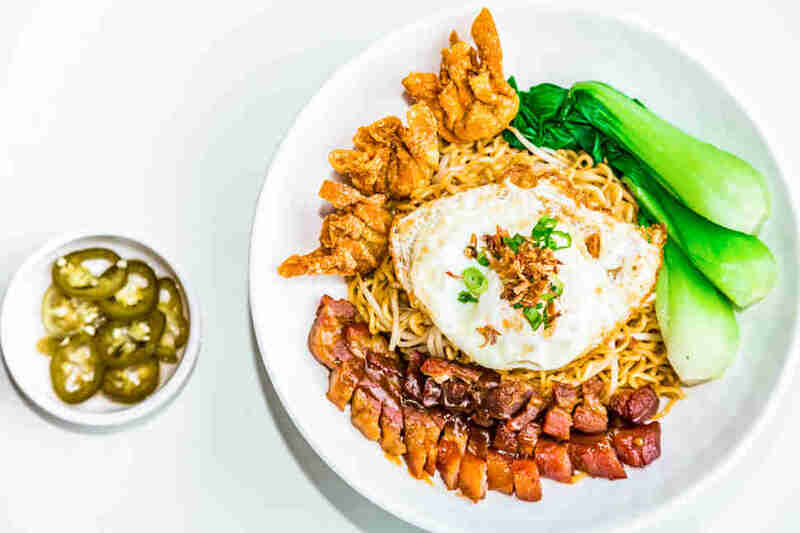 The restaurant’s mastery of noodles is perhaps best showcased in the Grandma Wonton BBQ Pork dish, where lo mein-like noodles are stir-fried in a slightly sweet but umami packed soy sauce-based mixture. 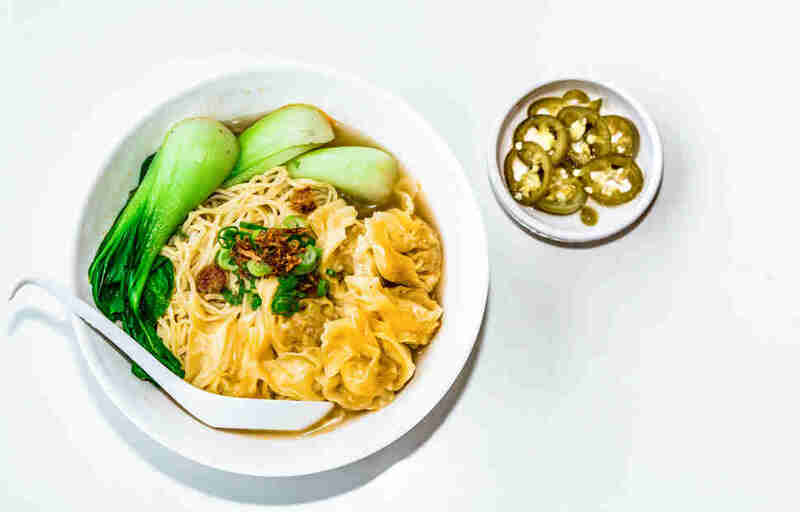 The tangle of noodles come topped with sautéed bok choy, verdant spring onions, fried wontons, a heap of barbecue pork slices, and a fried egg with delicately lacy edges. It’s not surprising that it is one of the most popular dishes on the menu. I’m partial to Food Terminal’s prized selection of garlic noodles, which are anything but traditional. The aforementioned noodles -- Food Terminal's signature -- are tossed with butter and an ample amount of roasted garlic. Each bowl is then layered with salty, mildly pungent egg yolk-coated shrimp or tender lump crab. Wong, who attributes the recipe to one of the restaurant’s general managers, says the idea for the noodles came from pasta they had eaten at a handful of crab boil spots in Louisiana. It’s this willingness to draw inspiration from anywhere that makes Food Terminal one of the most exciting restaurants in the country. Even those who are familiar with Malaysian food will find themselves surprised by the options on the menu. 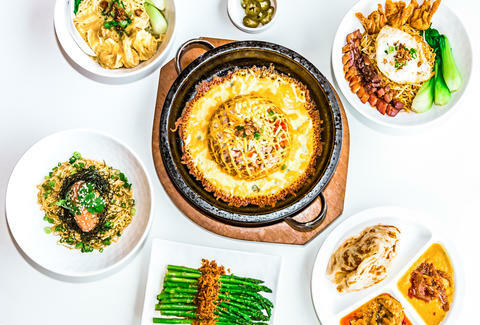 For example, one of the most rousing dishes at Food Terminal manages to combine Korean, Malaysian, and even Hawaiian traditions into a hearty and playful dish that just works. Called the Cheese ’N Cheese -- which is served in a scorchingly hot cast-iron pan -- the dish is part bibimbap, part fried rice. The brainchild of the same general manager behind the garlic noodles, the Cheese ’N Cheese starts with a base of tomato-braised rice that gets topped with corn, diced red onion and bell peppers, fried shallots, chunks of smoked bacon, and cubes of Spam. Handfuls of shredded Cheddar and mozzarella cheeses are rained over the sizzling mountain of rice and moat of scrambled egg circling it when the pan arrives. The eyes of everyone at my table, and the tables surrounding us, widened. As the server deftly mashed the components together, I stole a few bites. It’s very clear why people frequently come back for two meals in one day. I might start doing the same the next time I’m in Atlanta — after all, I still have over 100 dishes left to eat through. Khushbu Shah is the Senior Food Features Editor at Thrillist and recommends definitely getting the Cheese 'N Cheese and an order of garlic noodles. Follow her travels to the best restaurants around the country @khushandoj.